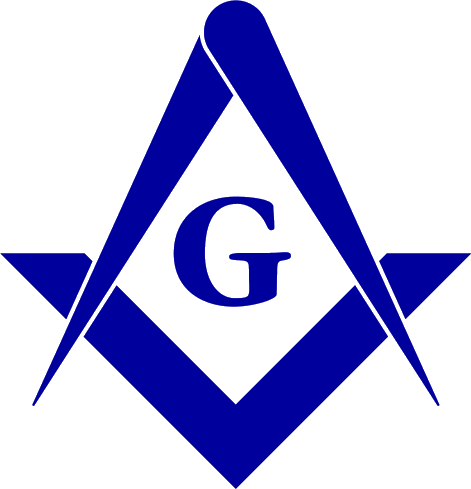 Founder of the The National Grange of the Order of Patrons of Husbandry, the nations oldest national agricultural organization, with granges established in 3,600 local communities in 37 states. 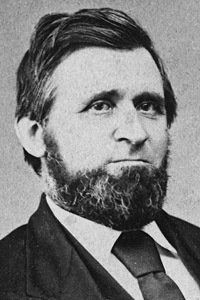 Born in Boston, Oliver Kelley moved to Minnesota in 1849 where he became a farmer. In 1864, as a clerk for the U.S. Bureau of Agriculture, Kelley received a commission from President Andrew Johnson to survey agricultural conditions in the Southern states following the American Civil War. At this time he conceived the idea of the Grange as a social and fraternal organization of farmers, and on December 4, 1867 he and six others secured the charter and Kelley became secretary until his resignation in 1878. The Grange was later instrumental in passing the "Granger Laws" which put an end to various abuses by the railroad industry in the late 1800s. 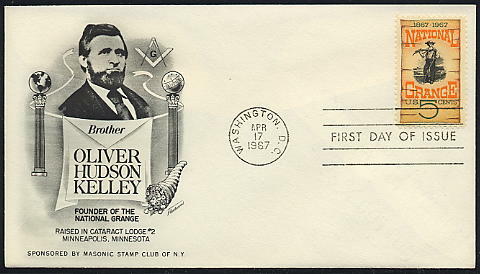 Source: Masonic Stamp Club of New York: first day cover. Photo: Oliver H. Kelley, 1875.